Voted the number one city in South Africa in the annual Quality of Living Survey, Durban certainly delivers when it comes to dining out. I was in the sun-kissed city for a long weekend and discovered some old and new favourites. 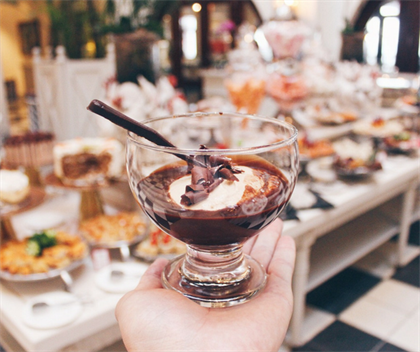 The hotel is a sensory experience par excellence, and in every way, the experience is a luxuriously decadent affair.High tea is served in the Palm Court, where the greenery echoes the tropical surroundings. The variety of savoury, sweet and in-between options will leave you spellbound, including a Durban twist with samosas and chilli bites. Be sure to ask about Skabenga – a famous local whose tea you’ll most likely be gifted with upon your arrival. Leave two to three hours for this visit, and be sure to arrive hungry. 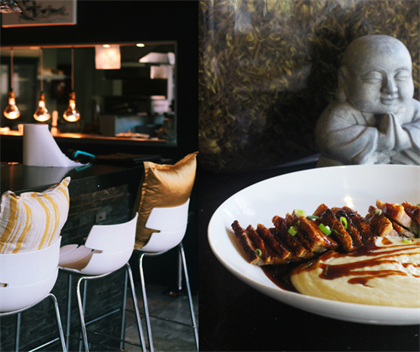 Staying in the upmarket suburb of Umhlanga, the next stop is the Greedy Buddha. After you’ve had your dose of shopping at Gateway, bypass the chain restaurants and make your way to this unique eatery. After living in Thailand and travelling the Far East extensively, owner Jess, wanted a kitchen that reflected his love for Asian cuisine. Don’t leave without trying their sushi platters, the Szechwan Chilli Halloumi Bites, and the Crispy Pork Belly & Prawn Tails is a signature order. Moving to the city itself, no Durban visit is replete without a walk on the Golden Mile. The owners were desirous of creating a more upmarket shisha nyama venue but with ocean vistas and within walking distance from the city.The restaurant is open all day and offers some lovely local twists to the traditional fare. Afroslaw replaces coleslaw, and the bacon in your SA Breakfast Braai is hot rock cooked, and the unique (steamed bread) is a definite must. As the day progresses, so does the music from Jazz to deep house in the evening. Barely a year old, it’s already a favourite with locals and tourists alike, so for those wanting a more authentic local experience, the Jazz Joint will hit the spot. 9th Ave Bistro is a neighbourhood eatery with upmarket dining, located in Morningside area and headed up by husband and wife foodies Graham & Gina Neilson. Among other accolades, the couple earned the Bistro the 2017 Conde Nast Gourmet Magazine People’s choice for South Africa’s favourite restaurant. Graham's culinary mastery is something to be savoured, with options such as chorizo-stuffed squid, gin cured salmon, gorgonzola, pear & candied pecan nut salad – and these are just the starters. For mains, I’d wholeheartedly suggest the crispy roasted free-range duck or artichoke & truffle risotto. This personal touch, combined with an understated elegance makes 9th Ave Bistro a must-visit. With the city’s large Indian population, it’s no surprise that curry houses are to be found on every corner. Danny’s House of Curries is located in the very unassuming Lugz Food Emporium. You can either eat in the communal seating or sit outside. It’s a social experience with locals picnicking, and usually, fisherman trying their luck in the lagoon.The prices are also as good as the food. A chicken curry and rice will set you back a mere R49, and ever popular and very filling mutton ½ bunny R98. You’ll understand afterwards why Danny Naidoo’s humble Curry House has now grown to several locations, including a few in Joburg. Durban’s iconic Hilton Hotel has had a recent renovation, and The Big Easy was the first to be completed. Big Easy is the brainchild of golfing legend Ernie Els, who wanted to ensure a comfortable dining experience, warm staff, and a generous menu. The oxtail and marrow fritters make for a sumptuous starter, as with the spice-rubbed lamb ribs. For mains, you can’t go wrong with a steak, and try out the Durban spiced butter as an accompaniment. If you’re brave, the bacon wrapped crocodile medallions is a tasty and unique option. Don’t leave with trying the baked apple crumble – home cooking comfort dessert at its best. Follow Jared's adventures on his blog and on Instagram.